To ensure the prolonged health of your heart, Mount Sinai Doctors Cardiovascular Consultants of Staten Island features a talented team of Cardiologists. Early detection of heart-related issues is imperative to your overall wellness. Keeping this in mind, our board certified staff is prepared to administer a modern collection of diagnostic tests and procedures while discussing lifestyle changes to prevent onset or progression of these conditions. Using high frequency sound waves, our team will assess the function of the chambers and valves of the heart. We provide transesophageal echocardiography and stress echocardiography to develop a greater understanding of the patient’s heart. Exercise stress tests, or chemical stress test (for patients who cannot exercise), offer a noninvasive method to evaluate the function of the heart and coronary artery circulation. To assess blood flow to heart muscles, a patient’s heart rate is increased by walking on a treadmill, or with chemicals, and then monitored. Stress tests can be combined with Echocardiography or nuclear imaging. If Dr. Ahilan suspects that you suffer from coronary artery disease, he may administer a stress test with a nuclear tracer to assess resting heart blood flow. Initially, a small portion of radioactive dye is injected into your blood stream. Next, the patient undergoes exercise or a chemical stress test and a second dose of radioactive isotope is injected into the blood stream. This technology helps to identify significant coronary artery narrowing (>70% narrowing) with high accuracy. Our nuclear camera is a Digirad Triple Head camera, which offers upright imaging in a chair, which is more comfortable for patients than imaging while lying flat. Upright imaging improves patient comfort by making it easier to breathe and by avoiding claustrophobia. The patient’s diaphragm moves more freely when sitting up than when lying down, resulting in a clearer image for evaluation by the doctor. Diaphragm artifacts in the image are minimized. 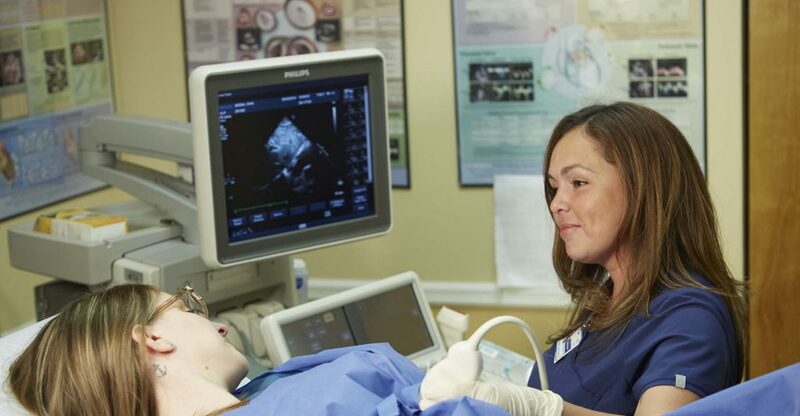 Ultrasonography measures blood flow, vessel diameter, and clot location using sound waves. This non-invasive technique employs Doppler ultrasound techniques to study patients without the risks and discomfort associated with injections and other invasive procedures. Most vascular disorders can be tested and diagnosed using this non-invasive technique. Holter monitors are worn on a belt or in your pocket and feature electrode patches that are placed on the chest. The machine records each heartbeat and heart rhythm continuously for a full day to aid in the diagnosis of rhythm disorders. When the 24-hour period is complete, the patient removes the electrode patches and delivers the device to the doctor’s office for analysis. Once the electrode patches are disconnected, the Holter monitor stops recording. From there, we are able to gauge the performance of your heart rhythm. Using a series of tests, our team will determine the presence of peripheral artery disease. Our screening process involves some combination of physical exams, ankle-brachial indexing, ultrasounds, and angiography.